Mr. Shang is slated to present at 9 a.m., and Falcon Structures will exhibit a trade show display at booth #303 for the duration of the conference. We’re assembling buildings in 40% of the time traditional construction would take, and at a lower cost. Falcon Structures CEO Stephen Shang will give a special presentation at the 2017 Offsite Construction Expo (OSCE). The conference will take place on November 15th at the Hyatt Regency in Dallas, Texas. Mr. Shang is slated to present at 9 a.m., and Falcon Structures will exhibit a trade show display at booth #303 for the duration of the conference. 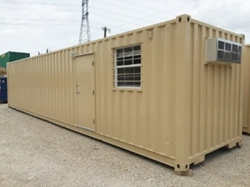 Founded in 2003, Falcon Structures repurposes shipping containers into safe and secure living, working and storage spaces - including training facilities, industrial enclosures, workforce housing units, jobsite offices, and more. Falcon’s growing client base includes major energy corporations, municipal governments, defense contractors, construction firms and the US Department of Defense.